With hindsight, this could be 2 big kids as easily as 3 small ones. I guess. The two filthiest newborn kids I've seen! It’s 8:02pm, Mar 1, and I’m headed back to the barn. Aggie ate her sweet feed at 5, but when I checked at 6, she was staring and pawing a little. 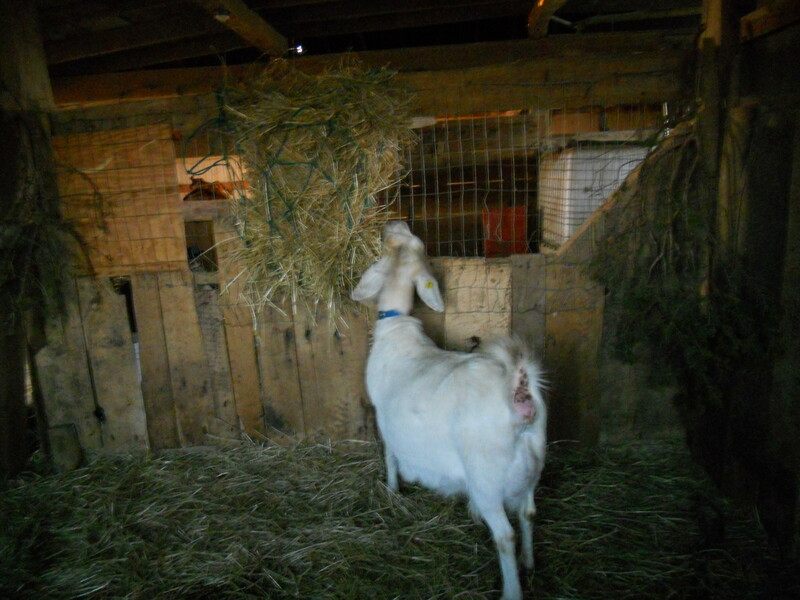 I piled fresh dry straw in the coziest corner, which she and Edie promptly began eating. Jess spelled me for supper, and didn’t see much activity. I watched till 7:30 and, when nothing happened, went in and did the dishes. Aggie had moved to the lowest, dampest, draftiest corner of the stall, pawed away the waste hay and dropped (we always say that but in this case it’s the only word that really applies) twins in the old floor dirt. And she’s diligently cleaning them. I’m sure there are 3, so Jess and I spend another 3 or 4 hours checking and worrying. Nope: just two, buck & doe, big and lively, a relief. 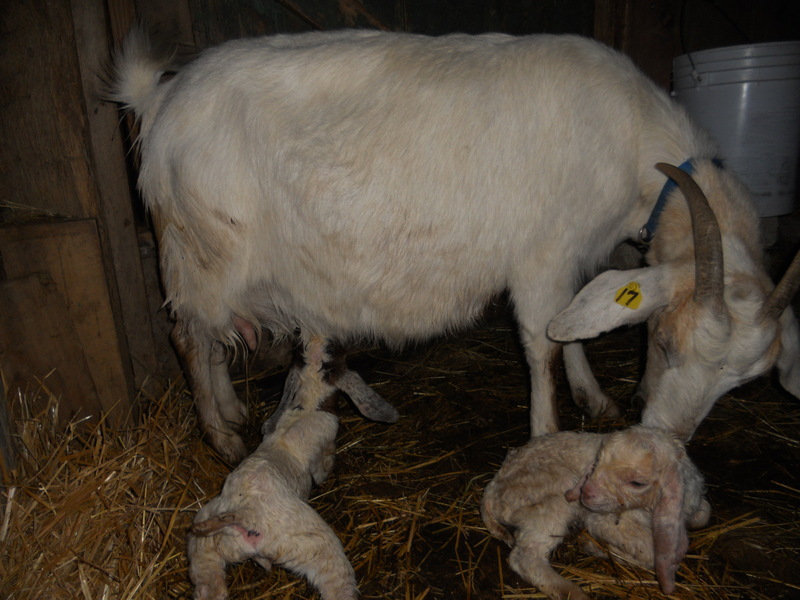 One of Jonquil’s December triplets was sold, and she is starting to feed up. But I hated to see another doe that gaunt and harried-looking. Sitting in the clean straw keeping an eye on Aggie, while Edie checks me for cookies and her doe kid sees if I'm good to climb on. Oh my gosh! What a dirty doe and babies! I wish we had been able to get the whole stall cleaned up for her. Is the doe kid the creamy one? And, is that little Lilac in the picture with Edie? Can’t wait to meet them all. What a wonderful way to start Spring!! 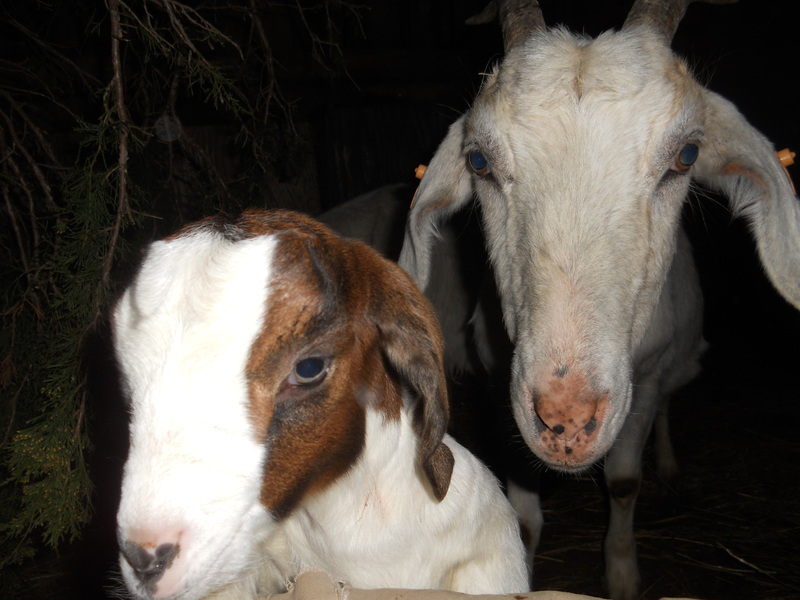 I’m glad to see the goats and kids….and know that they…and you…ar doing well!! So much for dry, warm and clean! Why does your tale bring to mind someone we know who never likes our ideas???? Cute kids! this is it for the year, right? I’ve lost count about who belongs to whom! and who has how many–but probably better that way–yep! May plan a trip soon —hope! Second: nope, Trillium & Nightshade, my lovely milkers, are due in late Mar, late April respectively. So, possibly 4 more! We did clean that side:she pawed down to the dirt anyway. The doe kid is the pale one, Briana named her Warda, Arabic for “flower” after her experiences in Morocco. And, yes, that’s Lilac in my lap. Exciting days to be on the farm! We’re going to need to fence off the whole farm at this rate.